It seems ironic that now that I live more in camping mode (no electricity) than I have for the past five years, I need advanced technology (smart phone) just to do basic stuff like get and keep jobs. The good news is I traced back through the solar panel wiring with my meter and found where it was incorrectly connected. Within a day the batteries were charged back up and no more shlepping heavy computer into town to charge it up. Home office is back on line. So now my trips to town are mostly about dog and social stuff. Sometimes both. I continue to be amazed by how deaf people get when I tell them no, please don’t touch the dog. It’s always the same. A fixed stare at Austin’s big dark eyes and doe-like ears and muzzle, and they MUST touch him. As if in a trance. “Is he friendly?” they say, not waiting for an answer. ComPLETELY unnerving to this 18 lb. dog to have a 6′ tall stranger reach for his head. I don’t blame him. Some fool threw chocolate cookies on my deck while I was out and Austin was on board. 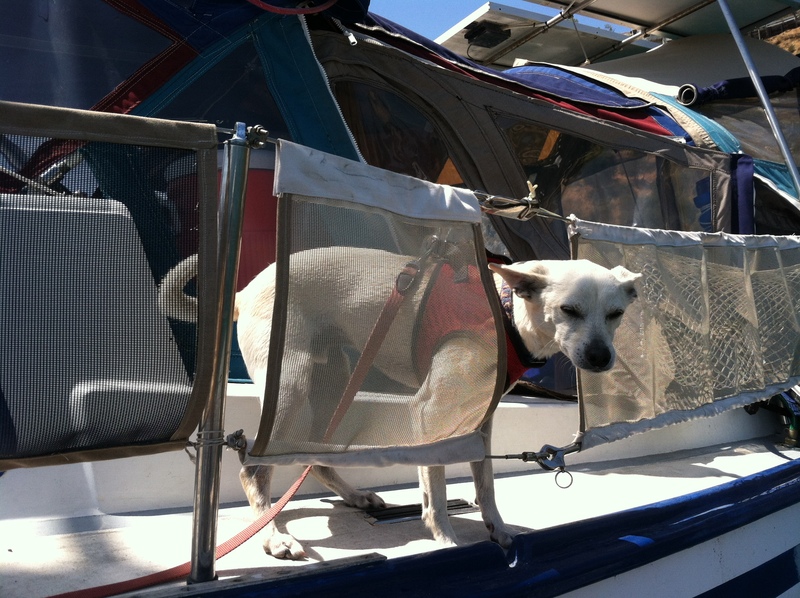 a) chocolate can be lethal for dogs b) throwing anything on a stranger’s boat is very poor boat etiquette – not to mention the mess of melting chocolate and c) teasing a small dog for sport is just mean. But it is pretty cute when Austin comes to the “door” to say hi, so I can understand how people might be drawn in to look. 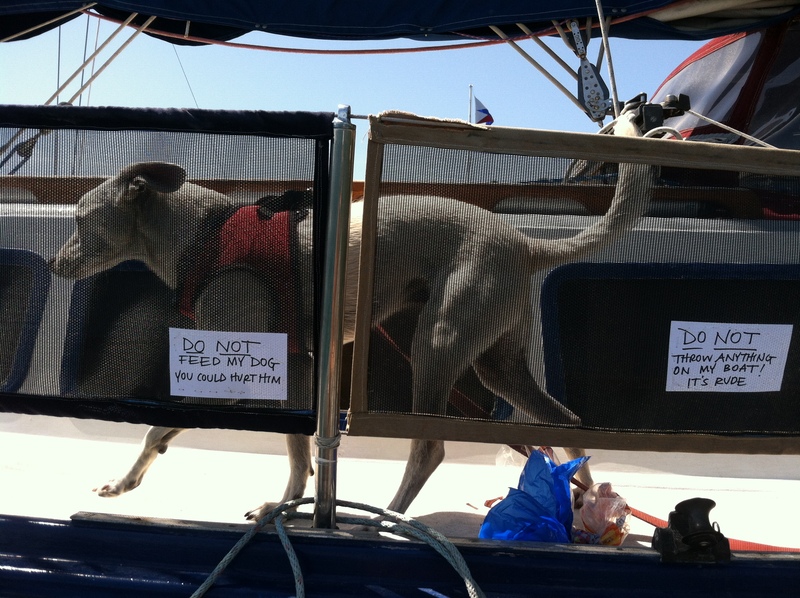 This entry was posted on Tuesday, April 23rd, 2013 at 8:29 pm and is filed under Cruising Life and Dogs. You can feed this entry. You can leave a response, or trackback from your own site.